Just when you thought the dust was settling on the best wind turbine design, the stakes have gotten higher — or in this case, wider. A new design called the Aerogenerator X (‘X’ to make it sound cooler?) would have a massive span of 275 meters and would produce a whopping ten megawatts of electricity — that’s three times the production capacity of typical modern commercial horizontal axis turbines. The innovative design is compared to a sycamore seed because it rotates on its axis, and it responds to the financial and technological limitations of scaling current three blade horizontal axis turbines for off-shore applications. The green engineering firm ARUP, along with a host of other players, recently concluded a viability study of the new Aerogenerator vertical axis concept. The battle over the best wind generator design has been raging for years now, and the clear winner thus far has been the three blade vertical axis type we have all become familiar with. At this point they’ve been designed to the peak of their economic and technological viability – if the blades get much bigger, stress from the weight can tear them apart. The vertical axis type up to this point has not been economically viable at smaller scales because they have a significantly smaller sweep to power ratio. Before you roll your eyes at yet another vertical axis concept, take a look at the technology under the hood. The design’s potential lays in the fact that most of the machine’s weight is concentrated at the base rather than the blades. The blades do not suffer from the constant changing stress of gravity, and hence can be built much lighter than a comparably-sized horizontal axis machine. The height is significantly reduced as well, which in turn reduces its visibility against the horizon. The consortium hopes to get a working model up and running in 2013. The claim that this generator is 3 times more powerful is rubbish Vestas have a 7MW generator already in production, also how do you make this turbine safe in hurricane winds? Conventional turbines turn side on to the wind allowing the structures to survive. 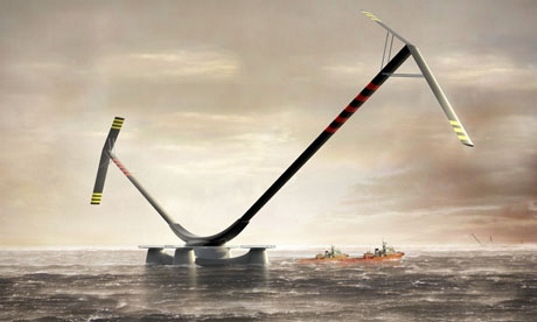 The problem with this design, other than the obvious questions about rogue waves, is why do you want a turbine design that is shorter when the higher up you go the stronger the winds? Cees, Sorry that "vertical axis" we linked to should read "horizontal axis"- our apologies for the mistake. As far as the gearing and generator specifics for this VAWT design we will have to wait and find out. So VAWT lacks torque, but the supposed VAWT you linked to is a HAWT. So this new VAWT design can crank more gears to spin the miraculous magnets faster? Can this design be used for in-city roof top installation. it will be lot smaller but will it be competitive to other roof top VAWTs. Just when you thought the dust was settling on the best wind turbine design, the stakes have gotten higher -- or in this case, wider. A new design called the Aerogenerator X (‘X’ to make it sound cooler?) would have a massive span of 275 meters and would produce a whopping ten megawatts of electricity -- that's three times the production capacity of typical modern commercial horizontal axis turbines. The innovative design is compared to a sycamore seed because it rotates on its axis, and it responds to the financial and technological limitations of scaling current three blade horizontal axis turbines for off-shore applications. The green engineering firm ARUP, along with a host of other players, recently concluded a viability study of the new Aerogenerator vertical axis concept.